Nanette Mathews once said that ”When you realize your life is not heading in the direction you wish, rather than wasting time complaining about the situation, just focus on the direction you wish to proceed with determination”. This is what Monique Murphy a silver medal winner in the Women’s 400m S10 at Rio Paralympics did. 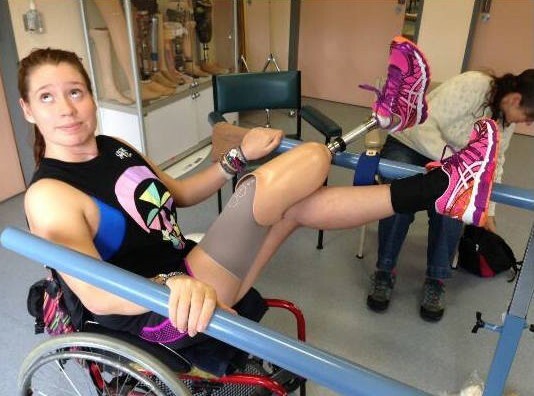 Though her leg was amputated she never grumbled; instead with great dedication and determination focused on her training, she overcame her disability with strong will power, only to succeed and excel in life. Monique Murphy was born at Wellington, New Zealand on 9 April 1994. She was living in Kipara and loved swimming from a very young age. Practising several hours, she aspired to represent Australia in Olympics. Practising and perfecting her strokes in order to keep up herself with the never ending competition and losing out many times she became frustrated. As soon as she finished her schooling in St. Clare’s in 2011, she decided to focus more on studies and shifted to Melbourne in 2013 to pursue Bachelor’s in social work at RMIT. In 2014 she met with a major accident which changed her life completely. While she was attending a university function on March 29, she had a fatal fall from fifth floor balcony, 20 metres smashing through a glass house. Monique said that she didn't exactly remember what happened on that evening, but thinks that her drink was spiked. She was injured very badly and slipped into coma. Her neck was slashed, glass pieces pierced through her body, she had fractured her jaw, ribs, knee and collarbone and needed reconstructive surgery. She recovered from coma after a week. Then she was disclosed that her right foot was amputated and she had to choose below the knee amputation as that was to give her more free mobility. Though she was depressed she assured her mother that she will be fine very soon. She considers herself very lucky as she survived the worst nightmare. She thought she can never ever compete again, but her brother Chris who encouraged and said that she can even now compete as a Paralympian. The piercing pain in the amputated limb was giving her sleepless nights, she was suggested to take up water therapy, whereby she discovered that swimming not only reduced her pain but filled in confidence, that she was not disabled as long as she was in water. Later in hospital when Mike Rolls a peer support mentor for Limbs 4 Life also an amputee and a scuba diver suggested her that they can create her a customized prosthetic fin with blue scales on it to give her a mermaid look, Murphy was more than happy and she soon joined a swim club and started her training under Alex Hirschauer. When her coach one day disclosed that Murphy had qualified for the National championships, her happiness knew no bounds as she least expected it. From then on there was no looking back, she saw herself equally good in 100 m butterfly as well as 400 m freestyle. Monique’s coach Hirschauer says that he is indeed very proud of Monique Murphy. She is an excellent swimmer with a great determination and strong will power which helped her to overcome her pain and disability and show her capabilities as a swimmer in Rio Paralympics. Murphy in turn feels that she was lucky to have him as her coach and that he knew her capabilities more than herself. Monique Murphy trained herself wearing a prosthetic fin and she calls it a mermaid leg which supported the muscles of her right leg while swimming. She says that she lacked confidence in herself as a kid contrarily now she has great self-confidence and determination. She is proud to represent her country in the Paralympic swimming team. Murphy competed in 50,100, 400 metre freestyle and 100 m backstroke swimming events. Monique Murphy says, participating in Rio Paralympic was like her dream coming true. She practised with great self-faith and confidence. She was also greatly inspired by her training partner Ashley McConell. Both bonded well and got trained together. Monique Murphy said that though Ashley was born without an arm she was able to do all work by herself and that motivated Monique a lot. The way she faced her life naturally inspired Monique Murphy to a great extent. She is very proud of her family, as they always stood by her supporting and encouraging her. She wants to see them happy always by winning more medals. Monique competed in four events at Rio Paralympics, but qualified only in 400m women’s S10 and won silver medal in 4:35:09 time. Monique Murphy is very happy of her achievement as she trained herself targeting 2020 Paralympics but as luck favoured her, she was able to perform well within a short span of two years from the date she met with an accident. Monique in 2016 got trained in Melbourne Vicentre and is a Victorian Institute of Sport scholarship holder, she later relocated to Gold Coast training under coach Glenn Baker and practises twelve times a week and involve herself in 3 gym sessions and is expecting to take part in 2020 Paralympics to be held at Tokyo. Monique was selected for the 2015 IPC World Swimming Championships Team. Competing at the Championships in Glasgow, Monique made two finals, finishing sixth in the 400m freestyle and seventh in the 100m butterfly. In the Rio Olympics she won the Silver medal in the women’s 400m freestyle and also competed in the 50m freestyle, 100m freestyle and 100m backstroke but did not make to the finals. Bethany Hamilton was born at Hanalei, Kauai, Hawaii on February 8th 1990. She is an American professional surfer who survived a 2003 shark attack in which her left arm was bitten off. After she lost her left hand, she returned again to professional surfing while proving herself as one of the very best surfers of the whole world. Hamilton got the titles such as NSSA National Competition in 2005 and O’Neill Island Girl Junior Pro tournament in the same year. Hamilton recently won the Surf ’n’ Sea Pipeline Women’s pro in 2014 in USA. Melissa was born on 31st January 1980 at Grand Haven, Michigan, United States. She is an American paratriathlete and former U.S. Army officer. Swimmer Melissa Stockwell was the first female soldier to lose a limb in the Iraq War while serving her duty as a lieutenant. She lost her left leg in a bomb explosion when she was leading a convoy to Baghdad. Melissa won the three consecutive gold medals in 2010 Budapest, 2011 Beijing and 2012 Auckland ITU Paratriathlon World Championships. Melissa was named USAT Paratriathlete of the Year in 2010 and awarded the Bronze Star and the Purple Heart for her service in Iraq. Natalia Partyka was born at Gdansk, Poland on 27th July 1989. She is a Polish table tennis player. She was born without a right hand and forearm. Natalia Partyka participates in competitions for athletes with disabilities and also participates in competitions for able-bodied athletes. Natalia won her first international table tennis medal in the 1999 disabled World Championship. Natalia is youngest Paralympian ever, at 11 competed at the 2000 Summer Paralympics in Sydney. Natalia won three gold medals at the European Paralympic Championships in 2007. Natalia represented Poland in both the 2008 Summer Olympics and the 2008 Summer Paralympics in Beijing and won a gold medal in the singles event and silver in the team event. Monique competed in four events at Rio Paralympics, but qualified only in 400m women’s S10 and won silver medal in 4:35:09 time. Malathi Krishnamurthy Holla was born on 6th July 1958 at Bangalore, India. She is an International Para athlete from India. When she was a baby, polio paralysed her whole body. She has had over 30 surgeries for broken bones in her legs. Although electric shock therapy for two years helped her upper body regain strength, her body wasted away below the waist. Despite this, Malathi Krishnamurthy Holla has won 389 gold’s, 27 silvers and 5 bronzes at national and international events, most of them on a rented wheelchair. At 56, she is still the fastest female Indian athlete on a wheelchair. She has received Padma Shri Award and Arjuna Award by Indian government. And she was named Woman of the Year, 1999 by American Biographical Institute, USA. In the same year, International Biographical Centre, Cambridge, United Kingdom also named her International Woman of the Year.